Electroencephalogram or EEG is a method of recording electrical activity of the brain. It measures the summation of voltage fluctuations resulting from ionic currents within the neurons. EEG refers to the recording of spontaneous electrical activity to specific stimuli over a period of time recorded from multiple electrodes placed on the scalp. Since its discovery EEG data studies have focused on intelligence, personality, psychosis and homosexuality, psychopathy, delinquency and immorality. In 2009 neuro-imaging was used in India during a murder trail. The judge during sentencing stated that an electro-encephalogram “left no doubt of experiential knowledge" which proved that the accused had to be the killer. Neuromarketing uses EEG to record activity in specific regions of the brain to measure changes in physiological state beyond awareness to learn why consumers make the decisions they do. Certain multinational companies with ambitions to predict and shape consumer behaviour, have invested in their own private laboratories and science personnel. 'Woman in Electrode Cap #1' is an illustration of our relationship to this technology but it is also a phenomenological portrait. 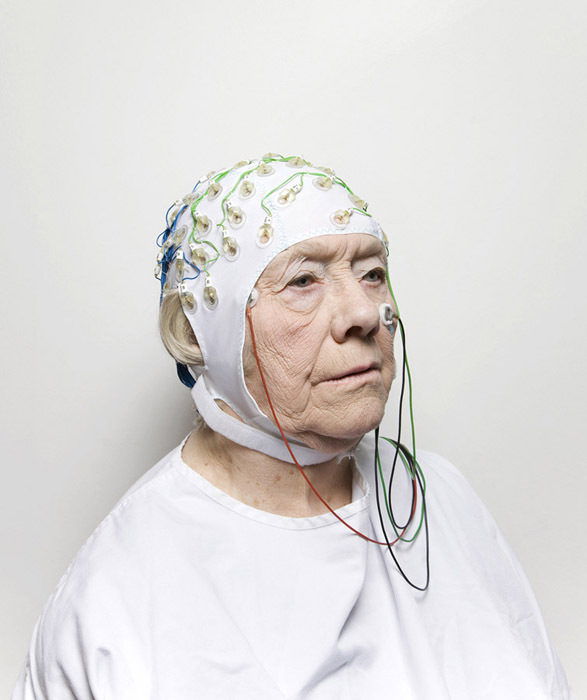 The EEG result, like an image formed by a camera is a record of our engagement with reality. The electrical brain impulses in response to stimuli transformed into the line on a graph and the order of pixels of an image are both forms of autobiography. In its nature 'Woman in Electrode Cap' is paradoxically a prelude to any engagement with the world and therefore itself. This image is an observation of the subject as observer. The final image presentation of ‘Boy in Stormtrooper Helmet’ has evolved over a 6 year period from the moment of capture in 2009 and this time has been essential in the decision to bring the image to public view. The boy in this image is now 11 years old and whilst we continue to protect his identity, he agreed in 2015 for it to be shown. There has been an ongoing discussion since the images conception with the family, recognizing that the existential nature of the image might be irrevocably altered by its introduction to the public realm, transforming a moment of intense privacy and beauty to a document and catalyst for a broader and unknown debate. As part of the discussion with the parents, we have examined the works by Sally Mann, Nan Golding, Boris Mikhailov and others, which famously brought ambivalence to their child subjects’ feelings. The response of Sally Mann’s son in adulthood was a major consideration in the decision by the father in not granting permission for the early release of the work. As with Mann’s work, which only exposes the naked torso of her son, we acknowledge the danger of unknown emotional damage to a child’s development in its exposure to public view. This is still a consideration as we accept that the permission granted is still from a child who is not fully appreciative of the complexity of the adult world. In entering the password for this gallery and viewing this image you are accepting the potential to be complicit and agree to accept responsibility for the content. I am supporting the artists of the LGBTQ event 'I am a Camera' this weekend hosted by the great people at FOTOFEST, Houston, Texas. To communicate queerness non-verbally and within the limitations of a two dimensional medium, we should consider whether sexuality actually has an identity. Exploring sexuality photographically first requires an overt focus on the persona that represents it. To be clear, I am referring here to Persona defined by Jung as the personality that an individual projects to society, as differentiated from a more complete or authentic self. To be homosexual is different to being defined as a homosexual. I recall the early silence I carried about my own sexuality, feeling like a form of lie when the the predominant expectation of society was (and still is to a large extent) that if you do not declare yourself as 'other' you are therefore inevitably pigeonholed as 'normal' defined as heterosexual. So coming out was and still is essential and with that comes a definition of self that is readable to the world. The need to define heterosexual at all is an indication that this majority political persona in itself is a sub-group also, all be it in the majority but this does not mean normal when discussing matters of sexuality and gender, it is not a politically democratic issue to be one thing or another; regardless of numbers all people are equal in their definition of self. The heterosexual persona must be recognised as defined and created as much as any other and not some form of 'natural state'. To work on a photographic project that in some way documents sexuality, the photographer must make a subjective choice as to what stereotypes to include or exclude be it queer or straight. To use an extreme example; if I posed in a spangly pair of hot pants and cowboy hat I might be construed as a homosexual man but if you saw me in my scruffy jeans and teeshirt in the high street, the trigger to recognise and define me as homosexual will not be activated. The photographer's urge to produce an image of value will often be led by the effectiveness of communicating a story or idea easily and this is often driven by stereotype. The queer community is complicit in this politicisation of LGBTQ persona, which began in the 60's and 70's, to make homosexuality seen as a defined group to help fight visible and invisible prejudice, hatred, intolerance and phobia. Indeed these persona stereotypes still exist today as form of cultural identity and are hugely useful as a support for anyone struggling to come to terms with their sexuality for the first time, including heterosexuals too. Persona's feel essential as we start to engage with society and they help immensely in the interaction with others but they act as mask to hide who we really are, our complex humanity beyond our sexuality. What was once a useful mask may eventually become an identity that defines us but does not fairly represent us. I speak from experience, my project of gay couples that first registered for the ground breaking London Partnership Register in 2001/2002 has always caused me much consternation in how to present it. I have never known quite where to place it and for many years I have excluded it from my public profile, although it has been the most instrumental project in defining my reputation. I feel that photography that documents sexuality as a lifestyle is unhelpful and unrepresentative, the focus of the two dimensional moment is on the lazy non-verbal definition of queer. Autobiographical queer work that sits as a series, including my own, is in its existential nature isolationist and self ghettoising. It reinforces stereotypes that seem like a barrier to progress now in society where equality is at least understood even if it is rejected. A more powerful message now is queer as normal, banal, mundane and un-extraordinary and truly equal, perhaps even eventually irrelevant. The couples in my early portraits of marital bliss dared to demand this form of equality which seemed radical at the time. Photographically this is why my project rarely makes an appearance in its original form. I occasionally enter it for exhibitions and competitions in countries where I consider the message of gay as 'normal' is such an anathema that my images can still have an impact and this was most successful in Moscow last year where the project was awarded 1st prize and shown in a Moscow gallery, flouting the strict anti-gay propaganda laws. This though is more about offering hope of a better world to those trapped in societies that are terrified of the realities of the human condition. I now show some of my gay images but they are mixed into a broader portfolio of works but not isolated in their own little patronising sub-camp. Gay sits with straight and we are all sharing the emotional complexity of being human, taking responsibility for our own fucked up lives and trying to be happy regardless of gender, sexuality or race. That's where I live anyway, come and join me if you like. Sexuality is hugely complex and way beyond the narrow political confines of the definitions we use to define ourselves and others. The artists in 'I am a Camera' are mostly well chosen and they are predominantly engaged in this more complex dialectic, I celebrate the artists presenting more ambivalent works. We are all capable of feeling love for each other in surprising ways that can be too complex to be seen easily through a camera. When I enter 'gay' into a search engine, these are the first two images that come up. Richard Ansett's images are in public and private collections including the National Portrait Galleries of London, Canada, Smithsonian, Washington DC, Bibliotheque Nationale de France and Musee de la Photographie, Belgium. Overall winner of the Arte Laguna Prize, Arsenale di Venezia 2013, 1st Prize, Grand Prix de la Decouverte 2013, Gold Award, Prix de la Photographie, Paris, 2011 and 1st Prize, Moscow International Foto Awards 2014.